The weekend after New Year day, I was invited to spend a weekend with a German family living in a town near Reutlingen in Baden-Württemberg. Initially, I had myself pursued the opportunity through DAAD Guest Family Weekend program, but right before the visit I was quite anxious about how things would turn out. First the place was a small town far away from Munich and then the family was hosting a DAAD student for the first time, so even our coordinator could not give much info about them. I only knew that my host – Dr. V. G. Bettac – was a retired dentist and she lived with her husband. We exchanged a few Whatsapp messages about the details of my arrival and food preferences. On the morning of 7th January, 2017, I left Munich in a Flixbus headed towards Bad Urach. My hosts would pick me up at the bus station which was around 6 km from where she lived. It was cold outside (-10C), and snowing all the way. I also had a sore throat. 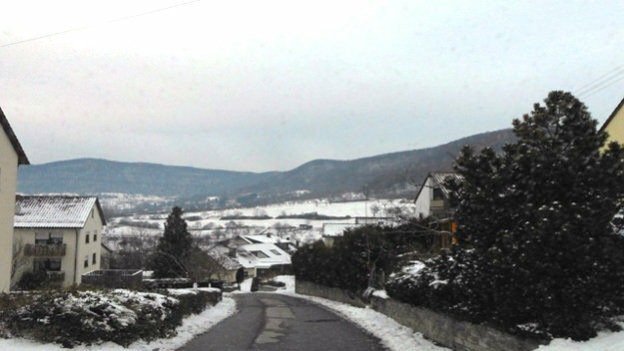 Before reaching Bad Urach, I could see snowy hills with people skiing and sledding around. I had only seen such view on TV, so it was a great sight. As I dropped from the bus at Bad Urach, a lady drove up in her Mercedez. She introduced herself as Mutzel and warmly welcomed me in her car. Upon knowing that I had sore throat, she took me straight to an Apotheke to get me some medicine. She bought some Mutschel, a traditional star-shaped bread from the region and told me the story behind Mutschel and Brezel. She was very enthusiastic in describing everything and it was hard to believe she was thrice my age. Her husband – Kristian – welcomed me with a soft smile to their beautiful house located on a hill called Buchhalde (German for: hill with the Buch tree). They guided me to my room with attached kitchen and bathroom. It was very comfortable and complete. Then, it was lunch time and I could not believe they had cooked rice and chicken curry for me. It is the traditional meal in Nepal. (Germans rarely eat rice or meat prepared in curry style.) They had read about Nepal over the Internet and planned it. The meal together with salad and dessert was lecker. Also their heritage cutlery set was beautiful. I had taken a small Buddha statue as a souvenir for them, and had prepared to explain to them the significance of Buddha, but they already knew a lot from their reading. Both of them followed the news and read quite keenly. Kristian had also been a Surgeon and with his wife a dental surgeon, the couple had been very busy pursuing their careers, so much that having children or enjoying a vacation, like most people do, had never been a priority. The important thing to learn was both of them had provided each other enough space to let them pursue their own chosen paths and still live together and maintain their loving relation for over four decades and more to come. After a busy work life (some days they had even worked 15 hours-a-day), they were now enjoying retirement. On regular days, Kristian would watch Biathlon on TV or read something, while his Frau loved playing tennis and piano. She participated in tennis tournaments regularly. She liked to keep fit, controlled her diet and trained regularly. A living example of age is only a number. So inspiring! Pratyush Jha - Participant in the Programme "Deutschland hautnah - Germany behind scenes"
The plan for the day was to visit the 500 years old wine factories in the nearby town Metzingen and roam around the Outlet city in the afternoon, return for dinner and then travel to Nürtingen to attend a classical western music performance by a popular regional band. Among the cobbled roads of old town Metzingen were the wine factory houses. 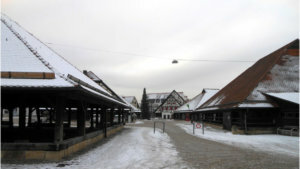 Wide single storey, hip roofed wooden houses separated by the grid of roads in between, serving as wine preparation, raw material storage, wine storage, party houses and administration in old times. Most of them are still functional as museums or public library. But they were closed on the Saturday afternoon and we just had a look from outside. Mutzel was telling me stories about the houses throughout our walk and topping it with her memories of the Netherlands and the curtain-less windows there. Walking through the town, we reached our next destination. With presence of dozens of global brands, the Outletcity was a very busy place; in stark contrast to the old wine factories where we were five minutes back. All the outlets were brimming with shoppers, visibly people from all around the world. And I thought Metzingen was a small town! Mutzel explained how Metzingen was the birthplace of Hugo Boss, the brand, and other entrepreneurs, and why Metzingen wooed all popular brands to have an Outlet here. It was great for the town’s economy and employment scene. The prices of all items in the outlet were significantly discounted as compared to their retail price. No wonder some shops had queues of people waiting to enter, in addition to crowd inside! Interestingly the heating and ventilation pipes overhead were not covered by false ceiling in any building, but I could not understand why. After the sightseeing and window shopping, we returned home for dinner. A traditional German dinner with salad and different types of bread with butter, cheese and marmalade. 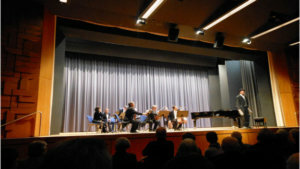 Then, the three of us headed to the musical show at Nürtingen in snowy weather. The 200-seater hall was full, mostly with people in the second half of their life. The conductor of the orchestra, who was also on piano, was very enthusiastic. He often brought the crowd to cheers and laughter with his short speeches and theatrics, but all in Deutsch. Mutzel would translate some of the punch lines to me in English. Nevertheless, I could fully enjoy the performance of pieces mostly from Johann Strauss. I had heard some of the pieces before as background symphonies in cartoons like Tom and Jerry and Road Runner, but I had not known those were some of the great western compositions. The three hour show with a half time break was full of musical highs from the band and long and loud cheers from audience. That was the end of day one; we returned home and went to bed straight away. Next morning we had breakfast at 9. Then we had planned to attend an award ceremony by the mayor of Metzingen, but the weather was very bad outside. It was snowy and windy; also roads would be dangerous on the hills. So we stayed indoors. Mutzel played some pieces from Bach on her grand piano. She also explained me the technicalities behind the composition, knowing that I too had interest in music and played guitar myself. It was soon lunchtime. She prepared lasagna which we had it with tomato sauce. Then, we prepared to leave for Stuttgart to attend the biggest Weihnachtscircus in the world! It had stopped snowing but the roads still appeared slippery in the afternoon. Nevertheless, Kristian’s BMW was reliable enough. Playing soft classical music and guided by the satellite navigation system for accessible roads, we reached Stuttgart in just over an hour. Parking was a big muddy field – half full at the time we reached. Kristian joked about not being able to find our car when we return. So all three of us had silently made a note of the surrounding where we parked (I guess.. since we had no difficulty at all finding it after the show ended). The circus was in a very large, warm tent. Eateries surrounded the entrance to the main hall. More than two-thousand people were in attendance – mostly families with young children. The shows kept on ascending in the level of talent on display. There were amazing performances from teams coming from all around the world. 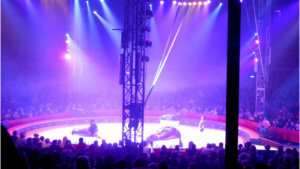 Most of them were acrobatic one, some were performances by animals including horses, dogs, seals, camels, etc. I had only seen those on TV or YouTube and now all those were happening right in front of me. The euphoria was overwhelming. The show ended at its highest,followed by more than five minutes of clapping from the spectators. Then we returned home and had dinner. It was a special Sunday.